The Maids of Wrath launches today — & Enter the Janitor is only $.99! Did I mention I’ve a book launching today? 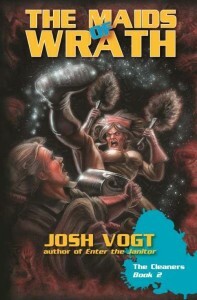 If you were one of the lucky folks at Emerald City Comicon, you might already have (signed) copy of The Maids of Wrath. If not, it is now officially launched today! You can get the ebook and print versions off Amazon and other main book retailers. The audiobook version will be available within a couple of days, for those who prefer that format! So for those of you who haven’t read Enter the Janitor yet, we’ve got a deal for you. The ebook is now only $.99 for the next few days! Grab it now and then you could even get The Maids of Wrath ebook version through the Humble Books Bundle happening for the next week. Two extremely easy ways to get into The Cleaners series. And if you’ve read either or both, I’d love it if you left a review on Amazon or Goodreads (positive or negative, yes). Celebrating a new book is always fun, so I hope you join in the experience! Previous Post Emerald City Comicon, Book Launches, and a Humble Books Bundle! Next Post Off to Origins Game Fair!